On a recent Saturday afternoon, Terri Bromberg hosted a glassblowing open house and sale in the art de- partment at Santa Monica College. With warm temperatures outside, the room that houses the furnace felt as hot as being inside an oven, perhaps because the furnace reaches 2,400 degrees. Bromberg, a 31-year resident of Pacific Palisades, began glassblowing at SMC 15 years ago. Now she is an associate professor at the school, where for 12 years she has been teaching a variety of classes, including glass fusion, stone carving and 3D design and sculpture. Bromberg surrounded by her glass wares. 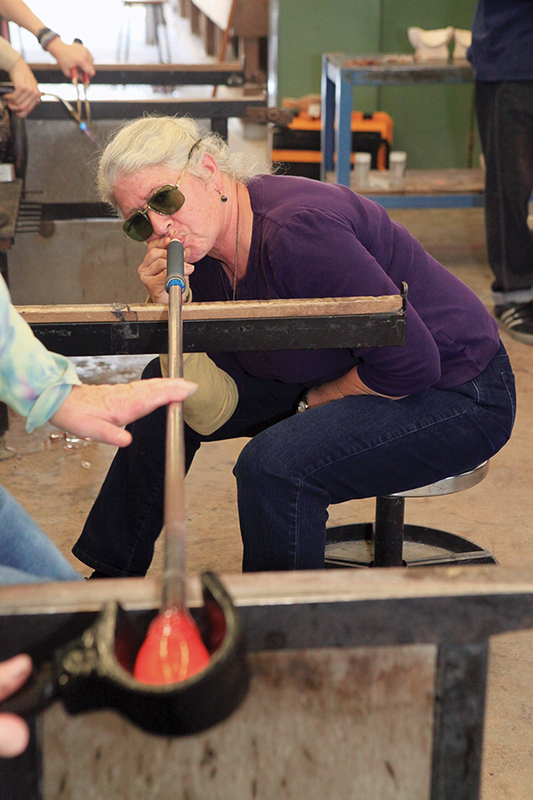 “This is the only teaching facility in the Los Angeles area that includes glass classes,” she told the Palisades News. Her classes, which fill up on the first day of registration, include about 30 students who range in age from high school and college kids to seniors. Bromberg’s class meets twice a week, plus an additional three hours of lab time per student per semester. Owing to high gas prices, many private studios in L.A. have closed, yet the San Francisco Bay area still boasts a thriving glass artist community. The demands of glassblowing, a centuries-old art form, are more challenging than many other art forms. The first step is to take glass from the furnace and begin blowing. Glass starts moving at 1,000 degrees, and can be reheated by put- ting it back in the fire, which allows the artist to alter the shape, and add colors and layers. “If the glass is hot enough, it blows very easily. If you see people turning purple from blowing too hard, they needed more heat. They’re blowing at the wrong time,” Bromberg said. 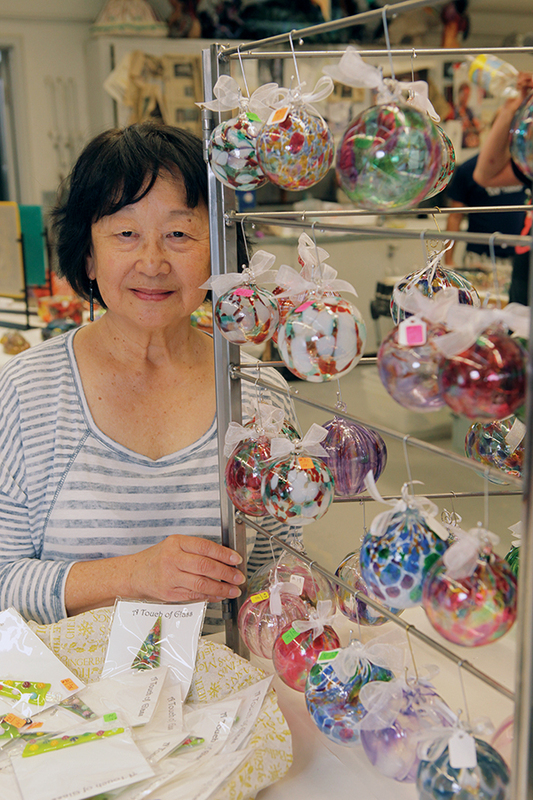 Palisadian Dorothy Miyake sells her Christmas ornaments at the SMC open house. “Sometimes we refer to it as an art sport, because depending on the weather, it can be over 100 degrees in the studio when you’re working,” she said. “You have to be physically fit because of the heat. Artist Terry Bromberg blowing glass. Bromberg encourages her students to drink a lot of water and sports drinks to stay hydrated. Beginners as well as advanced students have the same assignments, which are making a cylinder, a bowl and a plate. But first, they have to learn the basics, which includes how to blow a bubble and put a neck on it. “There’s a progression of skills, so the cylinder is opening the bubble a certain amount, and the bowl is controlling it in a different way and the plate is spinning it out with centrifugal force and getting a totally different shape. The fourth assignment is a narrow neck. That takes a different skill set,” Bromberg said. 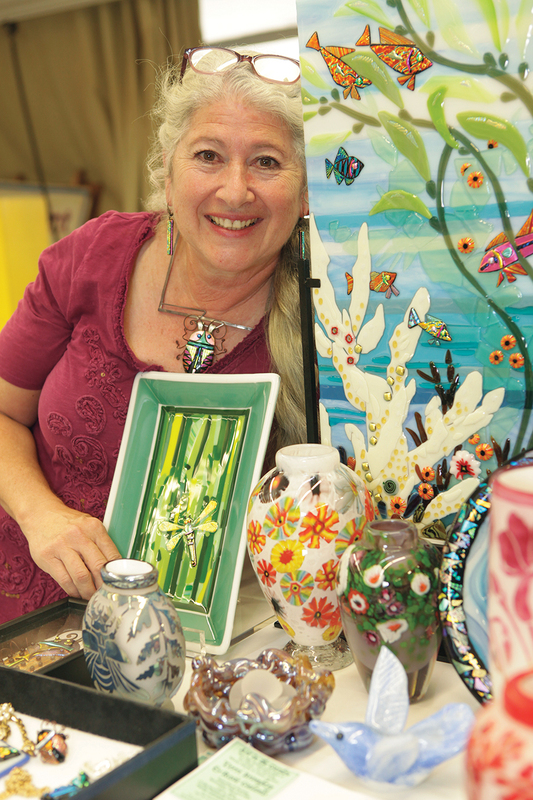 Each assignment builds on previous skills, and the final is a mixed-media glass project. Even though beginning and advanced students have the same assignments, their results may be different. Whereas a beginner is just learning how to make the proper shape, an advanced student can bring other, more complicated elements into the piece, such as color and glass cane. Cups are another popular item, and advanced students use glass cane to create colored lines. Working with glass can be challenging, and flexibility is necessary, as things don’t always go according to plan and ideas must then be altered midstream. Bromberg notes that “having a conversation with the glass” helps during the shaping process. 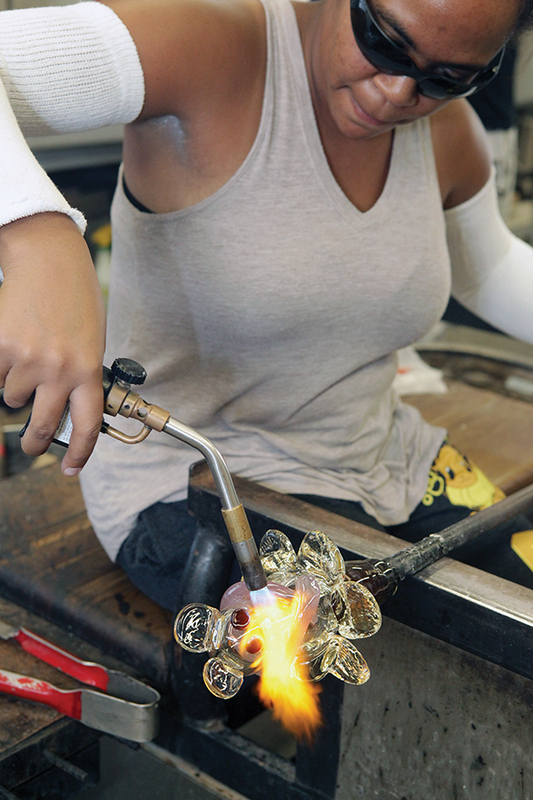 She describes glassblowing as something that is physically all-encompassing. “It’s more than just hands-on, it’s the whole body into it as far as moving back and forth and working with the glass. It’s a dance. You dance with the glass. 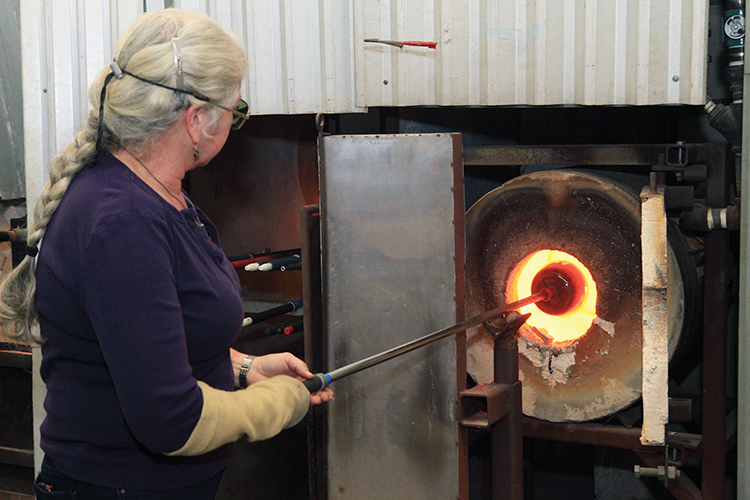 We call the work area in the studio the dance floor.” The annealing process cools the glass down, and prevents the glass from breaking. Every glass item, large or small, blown or fused, must be annealed. 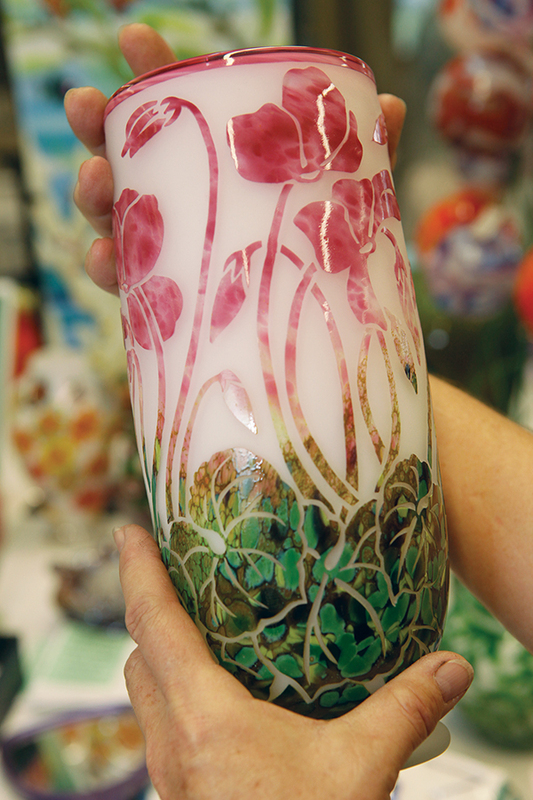 “They’re gorgeous to look at when it’s done,” Bromberg says about glass pieces. “The colors can be rich and enticing, and the fact that you’re working with transparents and opaques gives you a visual depth to some of the work that you can’t get” in other art forms, such as ceramics. During the open house, Santa Monica Canyon resident and SMC art student Susan Haskell was surrounded by her original fused-glass jewelry. Haskell started Bromberg on her glassblowing adventure years ago. Haskell is the art teacher at Canyon Elementary School, where her grandson currently attends, and where her children were also students. Both Bromberg and Haskell consider themselves lifelong learners, and are continually taking classes. Haskell demonstrated how to make a piece of fused-glass peppermint candy with a clear, twisted wrapper using a small flame to heat and melt the glass. Sticks called mandrills add color, in this case the peppermint stripes, and the whole piece was nearly complete in about 10 minutes. Fused glass is a different process than glassblowing; the glass is heated at a lower temperature, which creates a different look and dimension. Haskell and Bromberg’s works incorporate stunning colors. 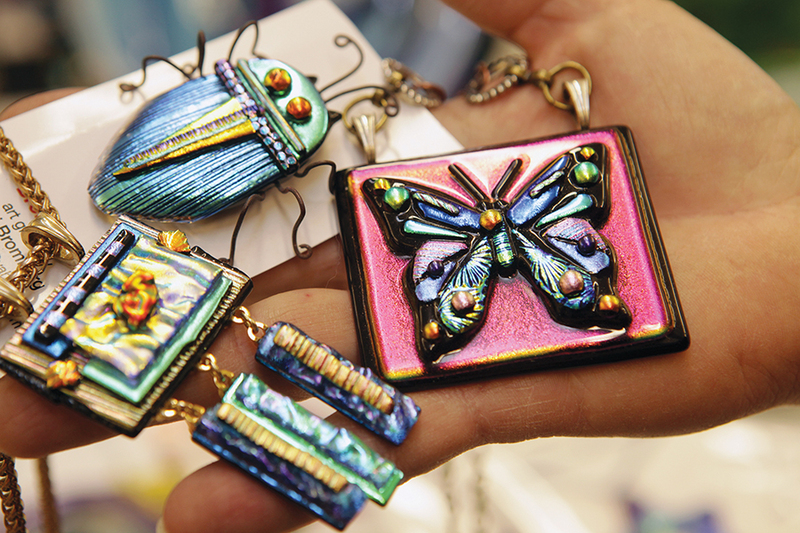 Bromberg often creates her fused-glass insect jewelry after teaching on Fridays. She works with handmade sheets of glass as well as dichroic glass, which was developed by the aerospace industry for the space shuttle, and has a metallic tint. It comes in myriad colors, patterns and textures. Bromberg’s background includes ceramics, graphic design, drawing and painting (including ambitious murals on the back wall of CVS and along a high retaining wall on Los Liones Drive). Though she enjoys these different artistic forms of expression, she finds glass the most exciting medium to work with. She likes to be hands-on and physical, something that sitting at her computer doesn’t fulfill. “I did ceramics for many years before I got into glass. It’s kind of an easy transition.” Bromberg takes lab time for herself every week, and makes a wide array of items including large, intricate plates and vases as well as little pumpkins and basic cups. I’ve always wondered what would happen if you inhaled while blowing glass, but both Bromberg and Haskell assured me that the pipe would get blocked and you wouldn’t get hurt at all. Student Jourdan Giron works on her project.During the open house, Bromberg had vases, jewelry, Christmas tree ornaments, pumpkins, plates, pins and more for sale. Her work can also be seen at the Pacific Palisades Art Association’s shows on the Village Green, and at Simon Meadow in October and December. During the open house, Bromberg had vases, jewelry, Christmas tree ornaments, pumpkins, plates, pins and more for sale. Her work can also be seen at the Pacific Palisades Art Association’s shows on the Village Green, and at Simon Meadow in October and December. Despite being a physically taxing art, which often leaves the creator on the sweaty side, Bromberg loves glassblowing.